Uses: College, Library, Schools Colors: Blue Lengths: 11 panel 20'-5" Heights: 6'-0"
Today, school libraries have transformed from a room with loads of bookshelves to a space offering innovative technology and meeting rooms. While this open space is flexible and convenient, it leaves little for privacy. 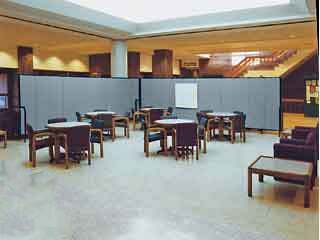 Portable room dividers are an easy solution for separating the open space into temporary classrooms when needed. When the dividers are not in use, they can be stored in a 2’x3′ space. Additionally, tack, pin or staple artwork to the fabric panels for a dynamic display.